Well, it feels like I've been gone for a long time...silly, I know! Just a day or so. I helped my cousin and his family set up a very fashionable wedding yesterday and today. Yesterday was beautiful, today: rain, rain, rain. Although right now the sun is shining beautifully, so the reception should be okay. But more about that in a few days. She used Soft Sky cardstock and Prints DP along with silver and Soft Sky inks! So pretty! Second, this is for Sharon's ssnotime37 challenge--to use black and white and one color. This is really not my favorite card...I just don't know what I am going to use it for!!! I used black, white and silver. I had some cool Mat Stack DP with a glitter design that kind of looked like fireworks to me, so I used it with the star from All Through the Year and a little $1 stamp from Michaels, both embossed in silver. I added a retired star eyelet and some silver cord to finish it off. I still want to do a plain b&w card because I like the look of it. Finally, I did today's SCS Challenge, a movie-inspired dress. This is the dress I used as my inspiration. Unfortunately, none of them really inspired me!!! But I liked this particular BG paper. For as simple as this card is, it too WAAAYYY too long to make and equally as long to photo. Paper is Very Vanilla, DP is Basic Grey LilyKate and Blush Blossom. Stamps are Verve Visual and although you can't see it, Floral BG is stamped on the bottom in Very Vanilla. Lace & ribbon are old, old, old from my stash. The sentiment was inked in Sahara Sand, stamped off, then stamped in Pretty in Pink to get a sort of grayish-pink color. Look what was in the mail yesterday! A sweet card from my blog friend Denise aka Peanutbee! She also sent me some fun images to color and make into my own cards. This card has so many fun layers--it's CB'd and watercolored, and I just love the ribbon & rickrack bow!! Since I can't have a real dog, I will have to make do with this little sweetie. You should check out Denise's blog, too. 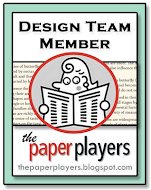 It's called The Paper Landscaper and its link is on the side of my blog. 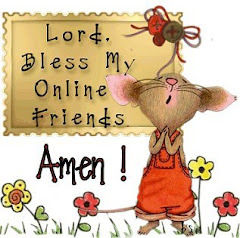 There has been so much going on around here that I have not had time to stamp, plus I think I am getting whatever yucky thing my DH had....so I am going to guzzle some Nyquil and say adios. I have a busy weekend ahead--I am helping my cousin, who runs the family florist business, with a huge wedding on Saturday, so I don't know how much stamping and posting I'll get done! Don't worry---I will be back! No posting of anything stamped today....I am taking some time to spend with my dad who lives a couple hours away. I had already had this trip planned when he called last night to tell me a dear family friend had passed away. So I really want to be there with him right now! Makes you realize how our time on earth is just a little "dot" on the line of your life, and eternity extends forever! (Not my idea, Randy Alcorn's!) So be sure to spend some time with your loved ones, and if you can't, tell them you love them! Also, don't forget my blog candy, posted here. You have until May 31 to post! One more post today before I am off to run my errands. My house smells like rhubarb pie--mmmmm! This is for today's Color Challenge---Chocolate Chip, Sage Shadow & Very Vanilla. What a wonderful combination! I wanted to do a simple card and use a stamp that I hadn't used in a long time. I think "A Tree For All Seasons" was one of the first sets I ever bought!! It is still a favorite, I just don't use it enough. Image is stamped in Timber Brown Stazon and watercolored with an aquapainter. The background is the fern from "A Touch of Nature". HPH is Antique Brass on Twill Ribbon; the "wish" is from Everyday Flexible Phrases. The green butterfly (which I am sure is not natural in real life!) has a tiny bit of glitter from my Jelly Roll pen. And Denise (peanutbee) is really rubbing off on me because I stamped the tree again on my inside piece. This card is 3.5 x 5" and will fit in a notecard envelope. TFL! 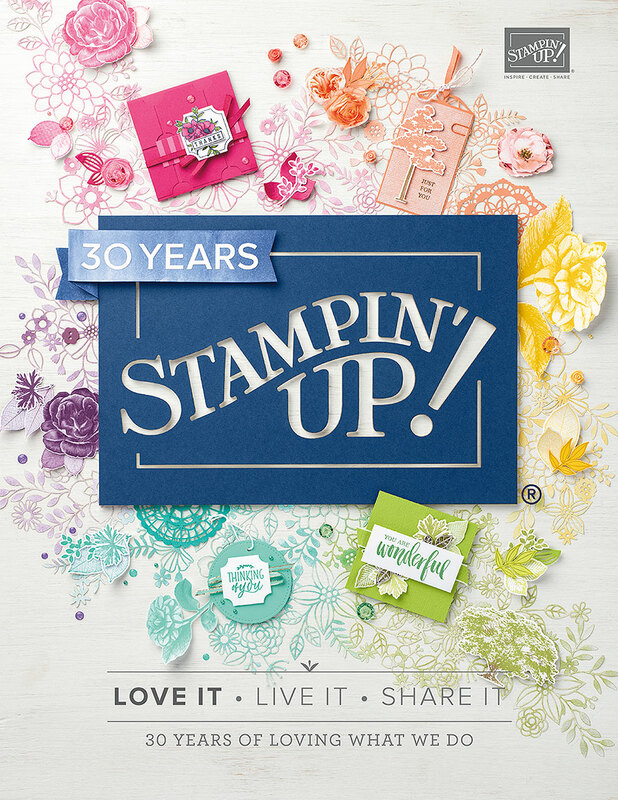 I was a stampin' fool last night! I was determined to get rid of some little half-finished images and pieces that were littering my table, so I cranked up my iced tea and went to work! This is a long post, so bear with me, but I won't put a lot of descriptions. Just look at them!! This butterfly was left over from my last stamp club and the card was left over from my last stamp camp, so I put them all together with a Swiss Dot piece that Anne gave me. I am sending this to my college roomie! This is a notecard made with a watercolored image I had made a while ago. The ribbon was some my daughter had left over from a wedding. This is a little Elzybell image I had paper-pieced with some Groovy Guava DP. I mounted it on some beautiful shimmery Swiss Dot paper from my friend Billie! Sentiment is from Papertrey. This is an image I downloaded from Vintage Workshops, which is an awesome sight if you love vintage things. I did overstamp it with Linen so it would go with my new Autumn Leaves DP. It's a pretty lame card, but I'll use it for a guy card. 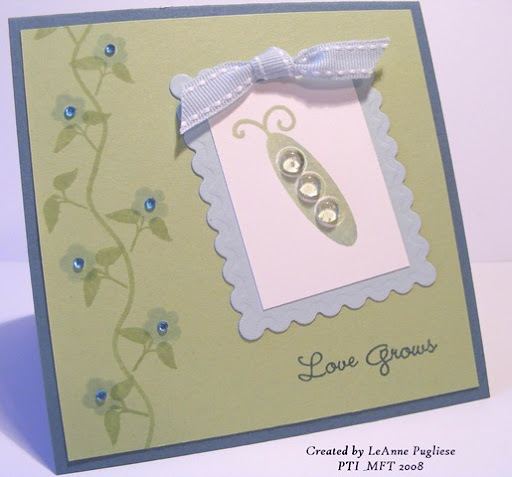 This card was NOT a scrap--I found a new blog showcasing Clean And Simple designs, so I used her first sketch to make a springy berry card with Papertrey's Green Thumb set. Since I knew it wouldn't take too long, I forged ahead! Are you tired yet? This is some more of my vintage Autumn Leaves paper, made into a business-size card with the little apple from Tart & Tangy. Cute, huh!? Sorry the photo really doesn't do it justice--just bad lighting here today due to yucky weather. A beautiful card from my friend Beth--I just love this ribbon! An adorable card my friend Julia sent me with some stamped images. Check out her blog here. A beautiful bookmark my friend Judy made for me using dried flowers! I finally finished my card for Sunday's Featured Stamper Challenge, my friend Denise, or Peanutbee. If it were anyone but her, I probably would have just let it go, but her stamping is just so beautiful, I really wanted to have a go at it! You can look at the card I used for my inspiration here. I changed the colors, the image, and made a circular focal point. This whole card is stamped with my new My Favorite Things set "Can Ya Dig It?". I again used my gingham digital paper from MFT, also seen in this post. I've done some masking on the image, watercolored with WC crayons, and cut out the watering can and mounted it on dimensionals. The white scallop border was done with my corner rounder. I know Denise likes to stamp on the inside of her cards, so I stamped a couple of the images on the inside of mine, too! I actually cut the "Love Grows" apart so that I can position the words wherever I want! Thanks for visiting! How do you win, you ask? Just leave me a comment here on this post, recounting your favorite childhood summer memory! I remember catching lightning bugs just at dusk and putting them in jars. We let them out later, of course! Summertime was a great time to grow up on a farm...until my mom made us work in the garden. Yuck! But then we got to cool off by swimming - not in a pool, but our pond! And I sure did like eating that corn on the cob!! Yahoo! I'll leave this open until May 31, then a winner will be chosen. Can't wait to hear your memories! Well, I have been a lazy stamper this weekend. Sometimes you just need a break....no challenges to post, but I have lots of ideas rolling around in my head from all the creative blogs I have been visiting! This card was created earlier in the week.....a card for a friend of ours who is an avid hunter and spends a lot of time at their cabin in the mountains. I downloaded some digital background paper from My Favorite Things and printed it on Kraft paper. Honestly, it took longer for me to feed the paper into my stubborn printer than it did to download the file! Since I like country things, I thought having gingham paper at my quick disposal would be fun! The image stamps are from Dad's Outdoors, HandM Stamps, the sentiment is from SU's It's Your Birthday, and the little leaf border (love it!) is from Impression Obsession, Autumn Seals. Each of the images was stamped in Chocolate Chip on Confetti White, then colored with my markers and punched out with a 1 1/4" square punch. Then I punched out a square of Really Rust, More Mustard and Old Olive on which to mount each one. The sentiment was stamped in Chocolate Chip also, and the leaf border in Creamy Caramel. Thanks for looking! I am taking a break from stamping today (sort of!) although I do have some things to post. This morning our little town had its little Memorial Day Parade. It is short & sweet, but it is meaningful in its own way. My DH was in the Navy Seabees, so he likes to march with the other participants. It is an emotional time when you think about all the men and women who have sacrificed their lives so we can live in this wonderful country. We should pray every day, thanking the Lord for the blessings we have. The local Lions Club and Seeing Eye Dogs--doesn't it look like the dog is waving? Thanks for sharing a little of our day! Now for some quickie stampin' stuff: these are some cards I stamped during the week for a stamp club girl who is expecting! She wants to make her baby announcements with a Wordsworth stamp, so she asked me for some suggestions. These are what I've come up with so far; I like to make very simple cards when I know my customers are going to be making a lot of them!! These are fairly simple, and there are ways to make the steps even easier: the star and the squares on the pink card can be punched out, and the bottom portion of the sailboat can also be punched out using the SU 1 1/4" punch!! How easy is that? TFL! You're going to be sick of my posting today, so I promise this will be the last one!! I found this blog, Stamp Something, and they had a Faux Challenge. So I decided to make a Faux Rusty Tin star to put on this really neat cowboy dp from Cosmo Cricket. This is a technique I demonstrated at SU's regionals in Virginia Beach last year. Hopefully, I will do another tutorial to show you how to do it also! I think it will make a great boy's card; I never have enough of them. Thanks for visiting! In my last post here, I said this card fulfilled the Kitchen Sink In the Garden Challenge....but I forgot I was only allowed to use KS stamps! And I had used a SU stamp. So I redid it, plus I wanted to fill you in a bit on how I did the image. This KS stamp is a 3-step stamp, so after I stamped my three images, I stamped the first image again on a post-it note and cut it out to make a mask. I placed the mask over my stamped image and stamped the leaves, then removed the mask. Then I stamped the ladybug in red & black. I took a clear yogurt lid and laid it over my image, and using my craft knife, cut around the lid, stopping where there was a leaf. Then I cut the leaves out by hand. I gave the flower a shadow by using my pastels and a q-tip; then I daubered the edges of my scallop circle to add a little depth. I thought the bottom right corner looked a little plain, so I added some punchouts, which will also qualify this for today's SCS Challenge--No Hardware!! I wanted my sentiment to be lined up a little differently so that it would fit the white space, so I actually cut it apart, so now I can align it any way I want! The beauty of clear stamps! No, this post is not about baseball! My card today fulfills three challenges, and I am also going to try my first tutorial!!! The tutorial is how to tie a "One-Hole Bow"; this is not my idea, it came from my upline, Pennie McCallum. If you have trouble with your ribbons, bows and knots sliding around on your card, check this out! Here's my card. I want to have a ribbon going across the card where the white & green cardstock meet, under my sentiment. Using my Anywhere Hole Punch and hammer, I punched a hole in my card. I used my punch because my crop-a-dile would not go in far enough. Lay your ribbon across your card, across the hole. Very carefully flip your card over keeping the ribbon in the same position. Put one tail end of the ribbon through the hole from the inside of the card. Now put the other tail through the same hole. It helps if you pull the first tail to the side a little to give you enough room for both tails to go through. Flip your card back over. Arrange the ribbons so that each tail is on opposite sides of the ribbon that is crossing your card. I like to call them "rabbit ears"!! Now tie your knot over top of the crossed ribbon. A single knot is usually enough. Now your ribbon and your knot are secure, without glue!! My finished card! This card fulfills Beate's Weekend Sketch; Sharon's Going Buggy Challenge; and Kitchen Sink's June In The Garden Challenge. And thanks again to Pennie for showing me this wonderful technique. Try it out and let me know how you like it! Edited to add: Ooops! I was not allowed to use anything but Kitchen Sink stamps for their challenge.....so, I will make a NEW card without the Boho Backgrounds!!! Reading the directions is important!!! I guess you could say these awards are like two sides of a coin--one side is sweet, the other sassy! Don't we all have two sides like that!!?? Anyway, here are my fellow stampers to whom I am passing on these awards. Make sure you check them out & give them a few words of encouragement! Give yourself some time to visit their blogs and enjoy their creativity! Thanks for visiting me today, too! One of my recent hostesses called me to finish her order and informed me that one of her three lovely collies had just had puppies the day after our workshop! It was a surprise to her as she had not even know the dog was pregnant. I can only imagine what the workshop would have been like if she had had them on that day!!! I realized this is the ONLY dog stamp I have!!! I need to rectify that! So even though these are not collies, I think she will enjoy this quick little card. The truck was colored with ink & an aquapainter; the other images I colored with markers. There is a little "doggie collar" embellishment and it is all mounted on some cute DP I just got from Autumn Leaves. TFL! I finally got my sewing machine back, and after seeing this card by Darlene this morning, I thought I would make a card with some Crafty Secret Cotton Scraps I had been hoarding. I love this Boxer paper by Basic Grey and I thought it went well with the veggies in my scrap. I am not crazy about my sentiment background, but I've already adhered it down, so it's there to stay. The button is from my sewing stash. This was a fun easy card to do, the most time-consuming thing was getting out my sewing machine! Thanks for visiting. Just a quick post today--I need to go mow our yard before it becomes any more of a jungle! I needed a card for a dear friend who just found out he has stage 4 cancer in his throat. I am hoping this will be a comfort to him and his family. This is also for today's SCS Sketch Challenge. 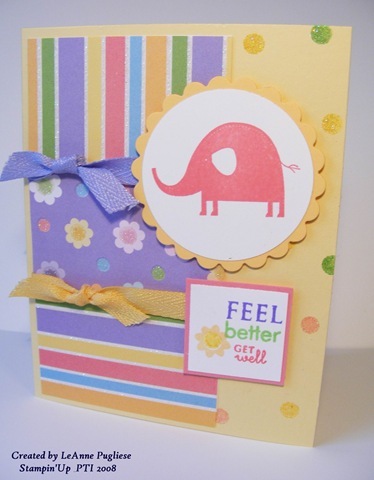 I needed a Get Well card for one of my best friend's daughters who is recovering from strep. I came across this layout on Toy's blog and thought it would be cute, especially since I just got some cool glittery DP at ACM. This also qualifies for Sharon's No Time To Stamp challenge, which was to use three panels. The image is from Nursery Necessities and is stamped with Regal Rose. The sentiment is from Papertrey, two sets: Paper Tray and Mixed Messages. The dots on the side, which are stamped with craft ink, have been heat embossed with Iridescent Ice, but it really isn't clear in the photo--click on it for a better view of all the glittery glitzyness!! The card base is Barely Banana, the scallop is Apricot Appeal and the DP is DCWV's Glitter Mat Stack. Twill is from Taylored Expressions. Thanks for looking! I hope she enjoys it and it does make her feel better! Today's SCS Color Challenge was to use Certainly Cele ry, Blue Bayou and Soft Sky---three of my favorite colors! 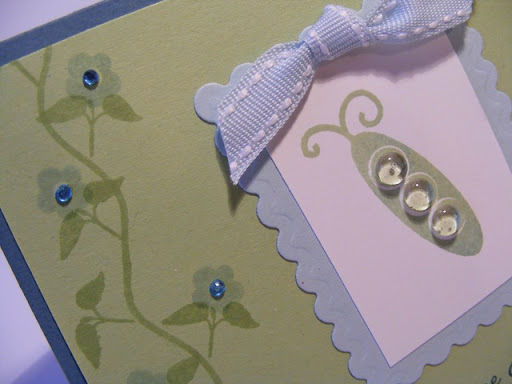 This is a real simple card, as you can see, but there are sweet little embellishments that I think make it a little special. 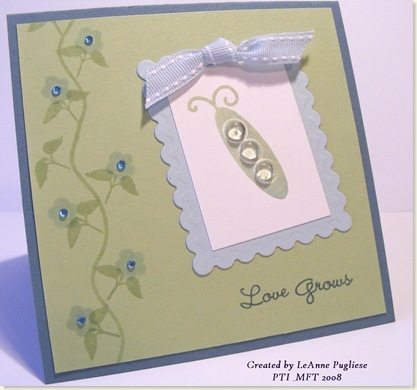 The bling and dewdrops are from Eclectic Paperie. The Soft Sky scalloped piece has also been embossed. Thanks for looking! Get Your Magnifying Glass Out!! !